We're Here for the Pig! In modern society we know there are people who feel a need to make money but giving false information is illegal in many cases. If someone states that an animal is going to be a specific weight/size when it is full-grown, BUYER BEWARE! Height/bone size is mainly determined through genetics. Nutrition will influence bone size but if an animal is limited to feed to minimize growth, the immune system and organ development can be impaired. Weight fluctuates as with humans. Excess calories = weight gain. Your animal's height will be indicated by the heights of its mothers/father/grandparents. If someone tells you what will be the full-grown weight of your pig, ask to see the mother and father AND ask for a veterinarian affidavit that the pigs are indeed a full-grown age of at least 4 years old. Without this information, BUYER BEWARE! 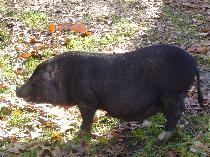 As of 2011, the United States Department of Agriculture classified miniature pigs as exotic pets. However, each state has its own classification as well. 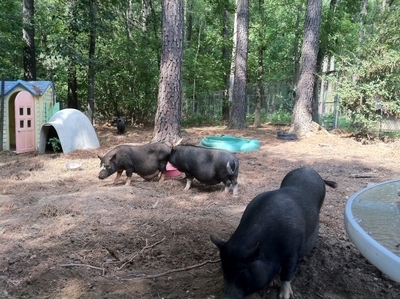 North Carolina classifies miniature pigs as livestock which means they are not allowed within certain cities/towns. Please check with the zoning/planning department in your location to see if miniature pigs are allowed. Should miniature pigs be spayed or neutered? Do both male and female miniature pigs have tusks? 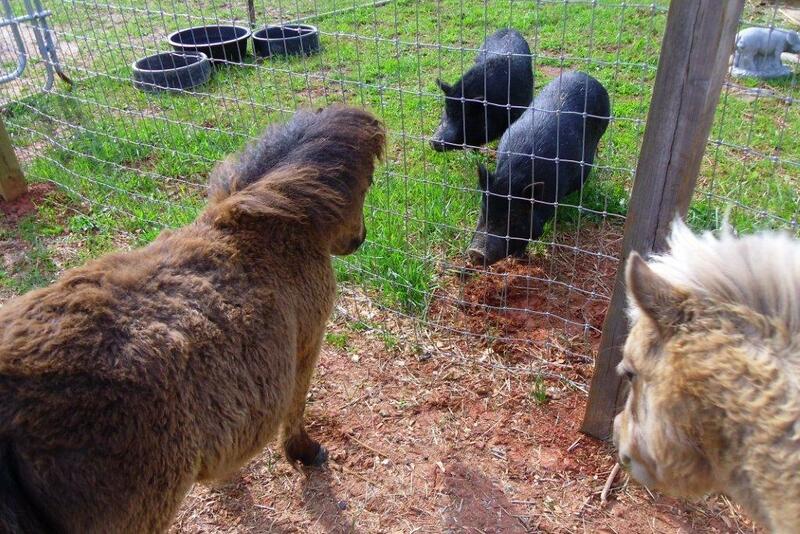 How do miniature pigs get along with other animals? Remember, pigs are prey animals. Therefore, their first instinct is to run and hide or else they may be harmed! It is not natural for a pig to bite first and then run, but that doesn't mean biting can't occur. Any animal has the potential to bite. Cats bite, dogs bite, horses bite, goats bite, hamsters bite! However in most cases, unless provoked, a pig would rather run than bite! Pigs are prey animals and dogs are predators. So there is a natural relationship of discord. However, each dog owner knows their companion best and how it relates with other animals. 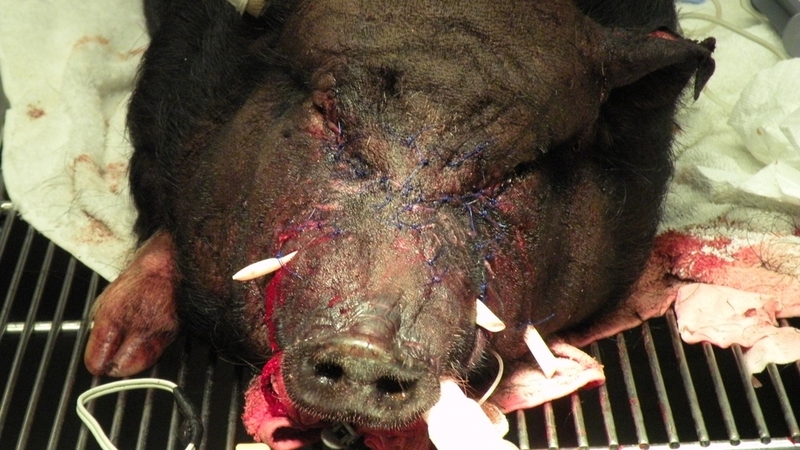 In our experience, we have seen many dog attacks occur to pigs. Unfortunately, the pigs do not normally survive. We encourage dog owners to never allow their dog and pig to interact unsupervised by humans. Keep in mind that a natural instinct is one that may lay dormant or hard for a human to see, but is not removed from the animal. There are dogs such as the Great Pyrenees that have a natural guarding instinct with livestock animals such as the miniature pig. Investigate your breed and know your companion, but always keep in mind the natural relationship between these two species. Special Note: "If you own pigs", it is imperative that you keep them safe from stray or wandering dogs. Fencing should be buried into the ground or tied tight at the bottom so that a dog can not go underneath it. Additionally, most dogs can easily go over 4' high fencing if they want to attack a pig. We suggest putting a strand of electrified fence along the top of the fencing. If you do not have an electric source, then purchase a solar charged fence charger(found at most home improvement stores). 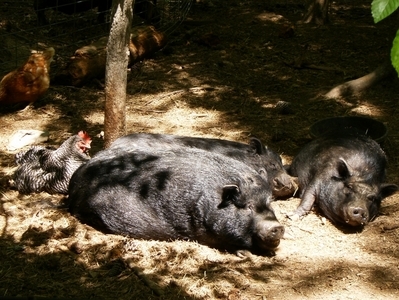 Our experience at the Pig Pals of NC sanctuary show that pigs and chickens can live in harmony. Although the chickens compete for the pigs' food they are also satisfied with snacking/pecking on the pigs' waste material which only helps to maintain a clean living environment for the pigs. It is a win-win situation. We have had little personal experience with pigs and goats but several of our adopters have both. Smaller breeds of goats such as the pygmy goats tend to co-habitat better than the larger breeds such as the Boer. The most difficult things we hear from people are the required separations during feeding times AND to be very cautious if your goats have horns. They can/will puncture and injure/kill a pig. Both pigs and horses are prey animals. However, because of their size difference, we encourage owners to use caution when allowing these two animals to interact. Horses can easily chase and hurt a pig with their large hooves. We have seen no better animal-to-animal relationship than that between the pig and cat. Even though the domestic cat is a predator, these two species are not in conflict with one another. A cat loves to rub on a pig and snuggle with them to sleep. Pigs, in turn, love the feel of cat fur and many fall for belly rubs when immediately touched.